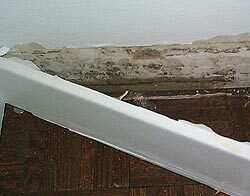 Mold is a microscopic organism that needs carbon and water to grow. Mold exists in 2 states. The vegetative state is its active or growth phase when it produces spores, and then growth-like projections called hyphae or collectively, mycelia. The non-vegetative state is its dormant or non-growth state. Mold spores are ubiquitous, meaning they exist everywhere. This is normal. What isn't normal is having active mold growth in your home due to water intrusion, flooding, water leaks, or condensation. Mold exposure can occur by inhaling, ingestion, or through an open wound. Mold does not necessarily cause a problem unless people are pre-disposed to mold allergies or have pre-existing medical conditions. The amount and type of mold that is needed to cause symptoms varies from person to person. Symptoms usually include sore throat, an itchy roof of the mouth, itchy ear canals, itchy eyes, headache, sinus congestion, post nasal drip, fatigue, wheezing, sneezing or coughing. The consequences of mold exposure can be more severe in infants, the elderly and people who are already sick (i.e. ; immunocompromised). It is possible to have serious symptoms such as asthma, a lung infection or a serious inflammation of the lung that requires treatment. Two types of tests have been developed by the EPA for these home test kits. The Environmental Relative Moldiness Index (ERMI©) which tests for 36 mold species and the American Relative Moldiness Index (ARMI©) which examines 13 mold species. The mold species chosen by the EPA for these tests underwent extensive research to identify those species that typically indicate problems in the home. The ERMI© test is a more in-depth analysis of mold species and the ARMI© test was developed as a lower cost option that also provides good results, but is not as extensive as the ERMI© test.